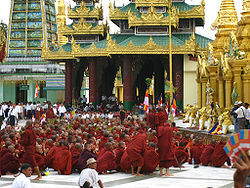 'S e dùthaich ann an Àisia a tha ann am Mianmar no Miànmar, ainm oifigeil: neo Union of Myanmar (Beurla). Tha ainm eile aice cuideachd: Burma . 'S e an dùthaich as motha a-rèir farsaingeachd a tha anns an tìr-mhòr Àisia-an-Earra-Dheas. Tha crìochan aice san earra-thuath leis na h-Innseachan, san ear le Làthos, sa tuath le Sluagh-phoblachd na Sìne san iar le Bangladais agus san ear-dheas le Tài-lann. U Win Tin, fear-naidheachd, neach-poileataigs agus prìosanach poileataigeach ann am Mianmar. Air a tharraing à "https://gd.wikipedia.org/w/index.php?title=Mianmar&oldid=525760"
Chaidh an duilleag seo a dheasachadh 20 dhen Dùbhlachd 2016 aig 23:02 turas mu dheireadh.